In large bowl, beat dry pudding mix and milk with whisk 2 minutes. Stir in cake mix and 1 cup of the crushed cookies until combined. Spread batter evenly in pan. Sprinkle chocolate chips evenly on top. Bake 30 to 35 minutes or until toothpick inserted in center of cake comes out clean. Cool completely in pan, about 1 hour. Spoon and spread whipped topping evenly over top of cooled cake. Sprinkle with remaining crushed cookies. Store covered in refrigerator. Cake is best served immediately after topping with whipped topping. Swap whipped topping with fresh whipped cream or your favorite frosting, if desired. 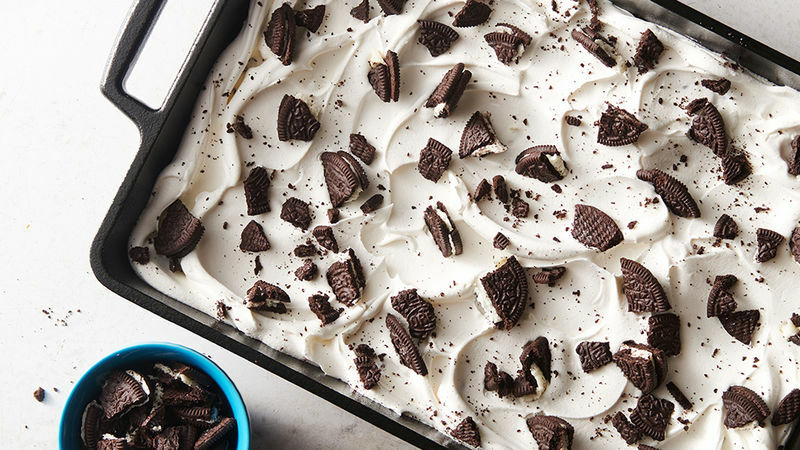 Don’t let the name “dump cake" throw you—this Oreo cake is as delicious as it is pretty. And “dump” just refers to how ridiculously easy it is to combine a few ingredients and dump them in a pan, so it’s perfect if you don’t have enough time to bake a cake from scratch.